Saute' leeks in oil until tender in the bottom of a large stock pot. Add potatoes and saute' until they begin to brown. Add garlic and agitate for a few minutes. Add chicken broth and 4 cups water. Bring to a boil and simmer on med until potatoes are soft. Mash slightly for a creamier texture. Saute' sausage until brown in another pan. Add the greens saute' until tender (adding salt helps tenderise tough winter greens such as kale, but saute' too much and they loose their color). Add to soup. It was very good. Perfect compliment to my Onion Upside-Down Cornbread or a Puglese loaf (traditional italian bread loaf) cut in half and topped with Provalone cheese. 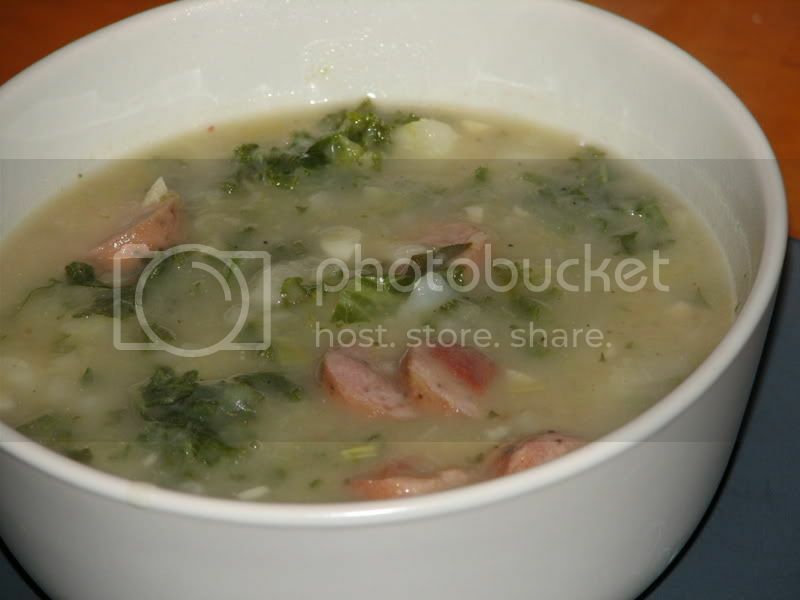 This soup can have many variations once you make it once you will see what I mean. Adding a tiny bit of Sage would have brought depth to the flavor but it was good just how it was.